The 2018 film “The Predator” is officially coming to 4K UHD Blu-ray and Blu-ray Disc on December 18th via Fox. The film, directed by Shane Black, features a cast of Boyd Holbrook, Trevante Rhodes, Jacob Tremblay, Keegan-Michael Key, Olivia Munn, Sterling K. Brown, Thomas Jane, Alfie Allen, Augusto Aguilera, and Jake Busey. The tech specs for the 4K UHD Blu-ray release include 2160p in the 2.39:1 aspect ratio with HDR10 form of High Dynamic Range and Dolby Atmos sound. The Blu-ray tech specs include 1080p video in the 2.39:1 aspect ratio and DTS-HD 7.1 Master Audio sound. Both releases will come in the form of a “combo pack” with the 4K getting a Blu-ray included, the Blu-ray getting a DVD included, and both getting a Digital Copy of the film included. You can find the 4K UHD Blu-ray and Blu-ray releases available for PRE-ORDER over at Amazon. Bonus materials set to be included on both versions are listed below. It’s also worth noting that there will be an Exclusive Steelbook available for the 4K release over at Best Buy. 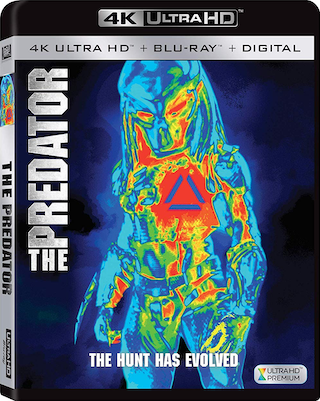 Further below, after the break, you can find the official announcement for the home video releases of this film – including a new bundled box set called “Predator 4-Movie Collection” that is coming to both 4K and Blu-ray on the exact same date. 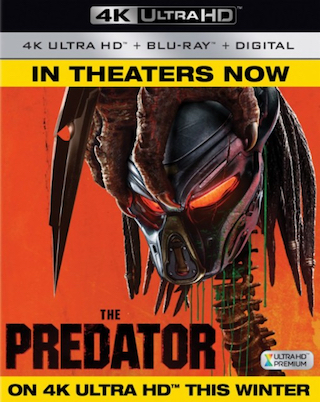 In an early alert to retailers we’ve got an indication when to expect the new 2018 Shane Black directed film “The Predator” on both 4K UHD Blu-ray and Blu-ray Disc, and that is sometime this winter (before the year end) via Fox Home Entertainment. This isn’t even a rumor, it’s stated in the working (not final) cover art pictured above. The film just hit theaters today, so go out and give it a watch tonight. No information yet regarding the technical specs or bonus materials for either the 4K or Blu-ray releases. I’d personally speculate you’ll see this get a December release, but stay tuned for any rumors or official update on the exact release date. It is known that retailer Best Buy will be getting an Exclusive Steelbook for the 4K UHD Blu-ray release of the film (pictured below). You can PRE-ORDER this 4K UHD Blu-ray Steelbook now over at Best Buy. Again, no exact release date has been announced (yet). You can also PRE-ORDER the 4K UHD Blu-ray and Blu-ray Disc versions of the film over at retailer Best Buy. Lastly, it’s worth noting that Amazon and other retailers don’t seem to be listing it yet. Below, after the break, you can find the artwork (perhaps not finalized) for the 4K Steelbook and Blu-ray versions of the film.